Ten years ago, Josiah Blackthorn disappeared into the wilderness with his then eight-year-old son Lucas. Both were presumed dead until the boy stumbles out of the woods and commits a crime, which sends him to a mental health facility in Duluth, Minnesota, an event that thrusts Lucas toward a collision course with Maya Stark laid out when they were children. 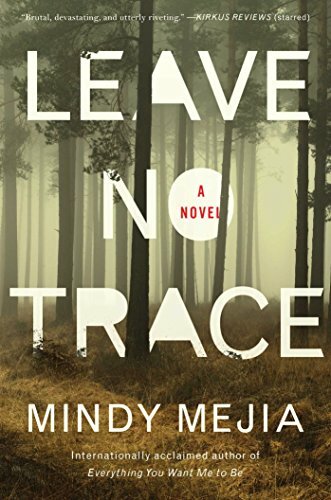 Leave No Trace by Mindy Mejia is part mystery, part coming of age, part love letter to the Boundary Waters of Northern Minnesota. Even when events take place in the port city of Duluth, merely the idea of the remote and pristine majesty of the north woods and its extensive lakes and streams overshadows the other environments. Maya Stark is an anti-social, troubled young woman who transitioned from patient to speech therapist at the same mental health facility where authorities commit Lucas. Through her work, she becomes introduced to “[t]he boy who came back from the dead.” More than introduced, she’s encouraged to participate in his reintroduction to the world. A plan that goes spectacularly wrong, or perhaps, in the end, exactly right. Mejia’s writing crosses back and forth between exquisite literary descriptions and thrilleresque escapes and acts of violence. Though some of the character behavior requires a strong suspension of disbelief, their complex development and the gorgeous prose makes reading it worthwhile. Underpinning the twisting, turning plot, is the constant theme of searching. Each character risks life and relationships to find the object of their desire. Maya’s father trolls the dangerous waters of Lake Superior for a long lost shipwreck, Lucas battles the authorities and rabid fans fascinated by his story in desperate attempts to break out of the institution and reunite with his father, and Maya yearns to unravel the mystery of her mother’s abandonment years before, no matter who she hurts or what laws she breaks in the process. Like Ahab and his white whale, however, the determination of the characters borders on obsession. Though we spend the majority of the chapters in first person in Maya’s head, Mejia also takes the reader inside the point of view of Josiah Blackthorn, the missing father. The shift in perspective allows the reader to view a larger landscape than Maya can see. This reveals the potential that Maya may cross a boundary from which she cannot return. Maya walks a fine line between several of the lost spaces that exist in modern society: mental illness versus a momentary loss of control, isolation versus integration, creating relationships versus living alone in the wild places where a person could slip under the water without leaving a ripple behind. Each time Maya appears to embrace a step forward into society, another event pushes her further and further away. There is a mystery at the heart of this novel, but the strength of Mejia’s writing comes less from the plot and more from the exploration of what makes us who we are. The impact of the choices made by Lucas and Maya’s parents on their childhood years translates into the obstacles they face as adults, as they fight authorities and conventional society. The only obstacle they face that does not try to force them to conform is the wilderness itself. The wilderness offers neither help nor hindrance; it merely exists on its own terms. People who choose to brave the dark unmarked depths of forest and river are left with solely their own abilities to survive. Though the characters in Leave No Trace are extreme in their situations, readers can find parallels to the uncaring “wilderness” in their own lives. Whether a crowded city or the uncharted ether of cyberspace, many people exist in a hostile environment relying on personal navigational skills to find a safe place to set up camp. Though most of us will never disappear into the wilderness, Mejia’s novel allows us to imagine why we might.